Synopsis: This is the most well-known collection of Brigham Young's teachings, and was taken out of the comprehensive and voluminous Journal of Discourses. Strong Points: This is a pretty well-rounded book of Brigham Young's teachings. It contains a wide variety of topics and much of it is quite interesting and powerful. 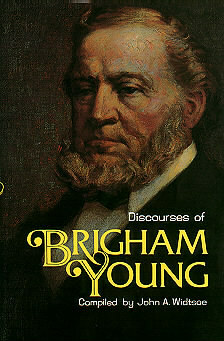 Reading it gives you a good understanding of how Brigham Young taught, what much of his teachings were, and even gives you some insight into what the man was like. Weak Points: Because Brigham Young was president of the Church for so long, and his teachings so multitudinous, it is difficult to put his teachings into such a concise format as a single volume - a natural challenge to this type of book. It is well-rounded, but the book seems to purposefully avoid the more controversial sayings of Brigham Young, a thing I found to be a little disappointing, yet understandable. My single biggest complaint, however, would be that much of the book contains practical advice and not really doctrine, and which parts were somewhat less interesting for me. But this is simply a reflection of Brigham Young's famous pragmatism.